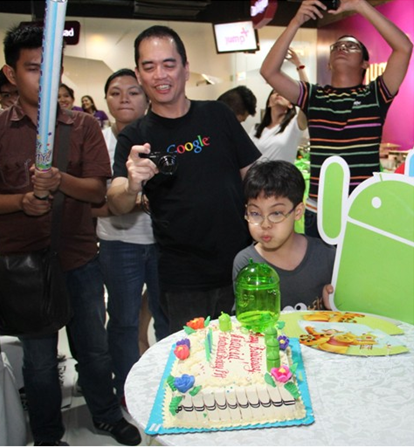 Smart Communications, Inc (Smart), nation's leading telcommunication company in partnership with Smart Developer Network (Smart DevNet), and Google Developers Group (GDG) Philippines kicked off the local celebrations marking the fifth year since the introduction of the Android mobile operating system, with a meetup of mobile development enthusiasts held recently at Jump Experience Center in SM Megamall. Photo: Happy Fifth Birthday Android! The event, dubbed “Appy Birthday, Android,” gave local mobile application (app) developers a chance to network with other Android enthusiasts. And for some developers, it was a chance to showcase the Android apps they have created. Android, the world’s leading smartphone platform with 75 percent of the market, is extremely popular among the mobile developer community because of its ease of use and open source nature. Smart is the first mobile operator to introduce an Android device in the country. GDG Philippines is a local community of developers interested in promoting the use of Google technologies for apps development.